Stephane Wrembel just released his new album The Django Experiment IV on January 23, 2019 which marks the 109th anniversary of the birth of Reinhardt. The Django Experiment Volume IV is a continuation of a special series of recordings. The concept is a tribute to the great guitar master, Django Reinhardt; mixing compositions and influences from other landscapes of the musical world, aiming to create an inner journey for the listener. Stephane Wrembel is quite simply one of the finest guitar players in the world. The breadth and range of his playing and compositions are unmatched. To say that Wrembel— who learned his craft among the Gypsies at campsites in the French countryside— has already had a remarkable career would be an under-statement. 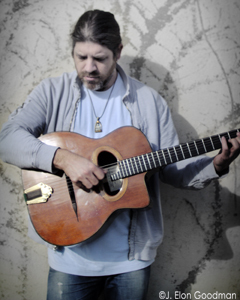 This prolific, virtuoso guitarist has been releasing a steady stream of music since 2006 and has truly made his mark as one of the most original guitar voices in contemporary music. Stephane Wrembel is widely known for “Bistro Fada”, the theme song from the 2011 Woody Allen Oscar winning film and Grammy Award winning soundtrack, Midnight In Paris. Born in Paris and raised in Fontainebleau, the home of Impressionism and Django, Wrembel has been based in the New York City region for the past 20 years and since his studies at Berklee. He has toured around the world, and is very active on the musical scene in many countries including USA, Canada, France, Israel and India. Recently, Stephane has performed as a headliner at the legendary Carnegie Hall and at The Town Hall in New York as well as at the Festival Django Reinhardt in France. Wrembel has also headlined at Lincoln Center, played major Festivals, recorded with mandolin legend David Grisman, toured with master violinist Mark O’Connor and shared stages with al long list of world renowned musicians. In 2017, Stephane Wrembel produced and headlined his Django A Gogo concert held at Carnegie Hall in New York. The event received rave reviews and included guitar masters Al Di Meola, Larry Keel, Stochelo Rosenberg and other gifted musicians all celebrating the music of Django Reinhardt. In 2018, Django a gogo was held at The Town Hall in New York. the show included many European masters of Jazz Manouche and featured bluegrass legend Sam Bush."